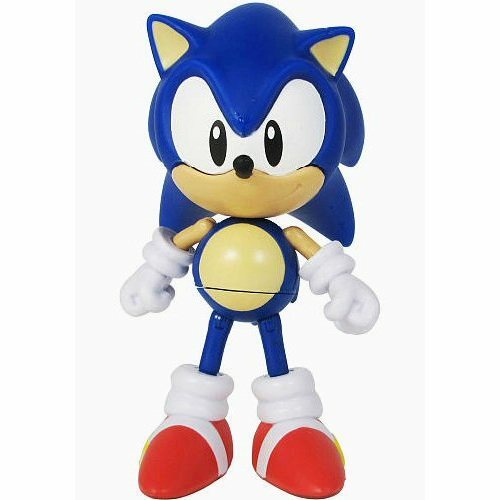 Buy Sonic 20th Anniversary: Sonic Through Time 1991 Action Figure [5"] in India at the best price. Screenshots, videos, reviews available. To celebrate the 20th anniversary of the first Sonic the Hedgehog video game, Jazwares has created a line of collectible figures that showcase the characters as they looked in 1991 and in their modern-day incarnations. Capable at traveling at the speed of sound, Sonic the Hedgehog is known for his speed, confident attitude, and readiness for any and all types of adventure. In his storyline, he calls upon all his skills to save the world from Dr. Eggman. Video game fans might remember playing out Sonic's heroic quest through SEGA's Sonic the Hedgehog video game series. This Sonic the Hedgehog 1991 figure features a poseable form & stands approximately 5 inches.